As Facebook and YouTube are two of the most reliable sources for trending videos, you may want to download and save videos from these two sites onto your iPhone or iPad. YouTube nowadays offers an option to download videos via Wi-Fi or cellular data on iPhone so that you can watch them later even offline, but it is available only for the premium users. But downloading Facebook videos to iPhone is still option-less. From Facebook, you can save your favorite videos to a list but you cannot watch them offline. 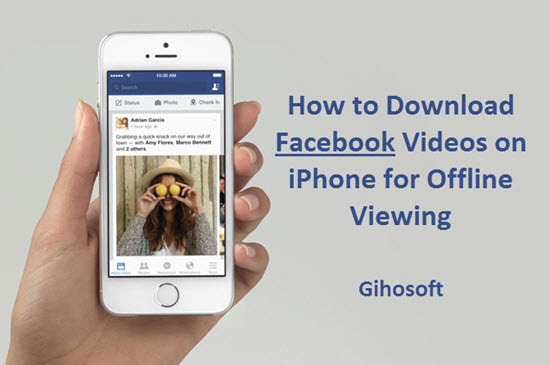 In recent past, there once was an iOS app, available for enabling the download of videos from Facebook for offline watching on your iOS device. But unfortunately that app is no more available in the App Store. In this article, there are two new handy tricks to help you effortlessly download and save Facebook videos to iPhone or iPad Camera Roll. Related Tips: If you ever lost any videos from your iOS camera roll, you can easily get the video back on iPhone/iPad with our handy professional tool Gihosoft iPhone Data Recovery. First You need to download the app MyMedia from the App store. The app will seem to you as a download and file manager and using the app you will get to streamline your media files on your Apple iPhone. Once the app is installed, now you open the Facebook app and check the video you wish to download. After you locate the video, you will get to see the option of sharing the video. Now tap on the option and then select copy link. 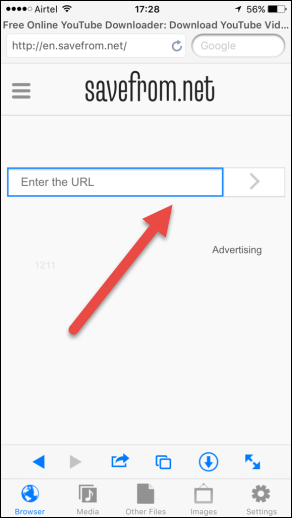 In this process, you will get to copy the direct URL of the target video on your iOS clipboard. Then open the app MyMedia App and it will direct you toward a new browser. You should open up a website called savefrom.net in this built-in browser. Paste the video link you get from Facebook app, and tap on the button for decoding the video link. In accordance to the video, you may choose between SD and HD download format. At last you click on the download button to start video downloading. Important declaration: If savefrom.net is saying that download link is not found, then try downfacebook.com or other Facebook video online downloaders and paste the link there. The app will allow you to rename the video as you like. 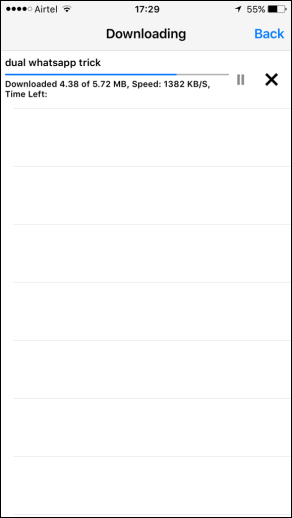 When the downloading process finished, you will be able to see the file in the Media tab of the app. Now, you can watch the videos directly from the app. Furthermore, you may choose to save the video to iPhone camera roll or share via WhatsApp and Twitter. Workflow is another utility app available on iOS App Store. Initially, it was a paid app but now it is available free for download and use. It’s quite handy as a personal automation tool, permitting you to blend and perform a series of actions to streamline repetitive works like create GIF or Facebook video downloading for offline viewing. Get the Workflow app for iOS from the Apps Store. 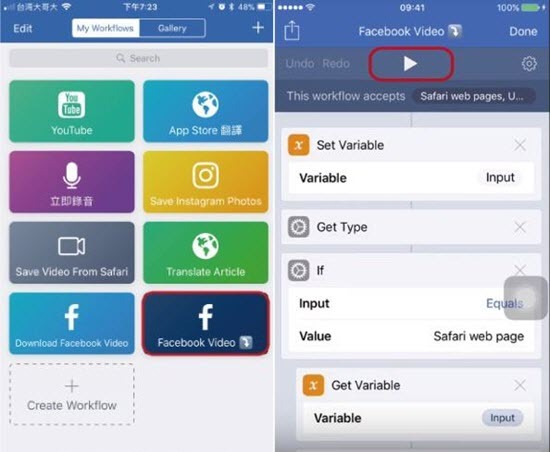 Since you need to download Facebook videos with the app, you will need to install a workflow order for it. Find a vaild workflow order on the Internet, or open this link on Safari browser to initiate the function of Facebook video downloading. 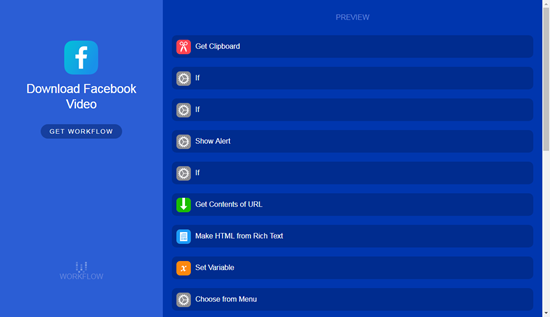 Tap on the button ‘Get Workflow’ to set up Workflow on your iOS device successfully. 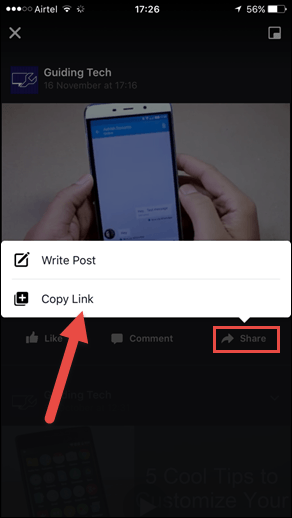 Tap on the share button of the Facebook video you would like to download, and then click on ‘Copy Link’ to get the specific URL. Now, all you are supposed to do is open the Workflow app, and click into the Wordflow order you just installed. Since you’ve already copied the video link to clipboard, you just need to tap on the “Play” button on the top. As it is an automation app, it will robotically download the target video for you and will save it to your iOS camera roll. These are the simple and user-friendly ways to download and save Facebook Videos on your iPhone. Your then can view the Facebook videos offline on your iPhone anywhere without network connection. If you have any other good method to easily save Facebook videos on iPhone for offline viewing, welcome to share with us in the comment section below.